This version stands at just under 1", and is the lighter of the 2 versions of this design I make. 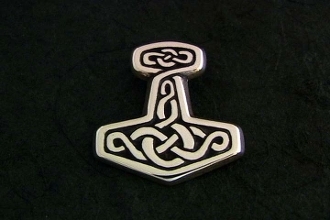 This modern and original "Thor's hammer" design expresses honor for the Nordic and Viking styles of knot work in the context of an old world hammer layout. I make 2 sizes, and this is the smaller and lighter of the two. The chain bale is at the back of the top and is a strong loop for the chain to pass through. The larger one I make is twice as thick as this one, which is shown as a separate product.